Our media room makeover is finally complete! 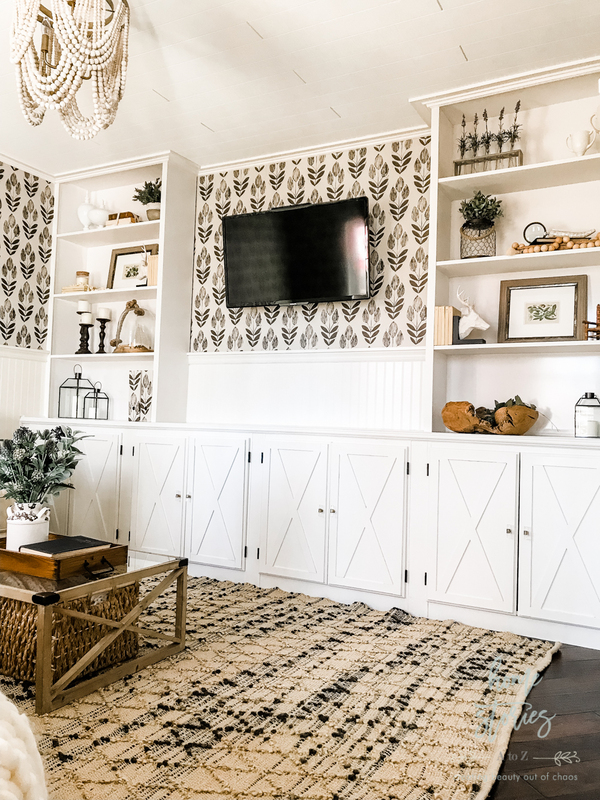 We covered the popcorn ceiling, added DIY built-in bookshelves, and freshened the walls with wallpaper to transform this small space into one of our favorite rooms in the house! All room sources are linked at the bottom of the post. When we moved into our home a year and a half ago, I wasn’t exactly sure how we would use the small 12×12 room at the front of the house. 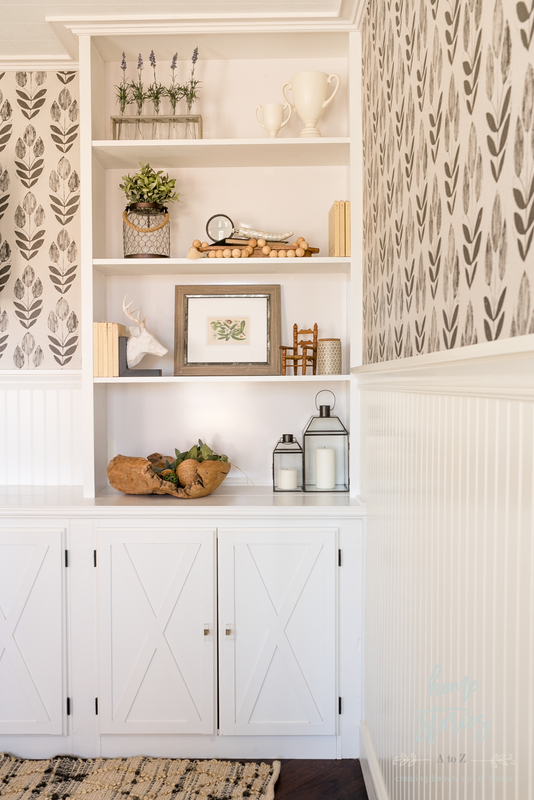 It was originally a dining room and the previous homeowners closed off the space to create an office when they remodeled the kitchen. I thought the room would make a cozy media room, but here it sat looking like a storage room for over a year until I could figure out exactly how best to utilize the space. 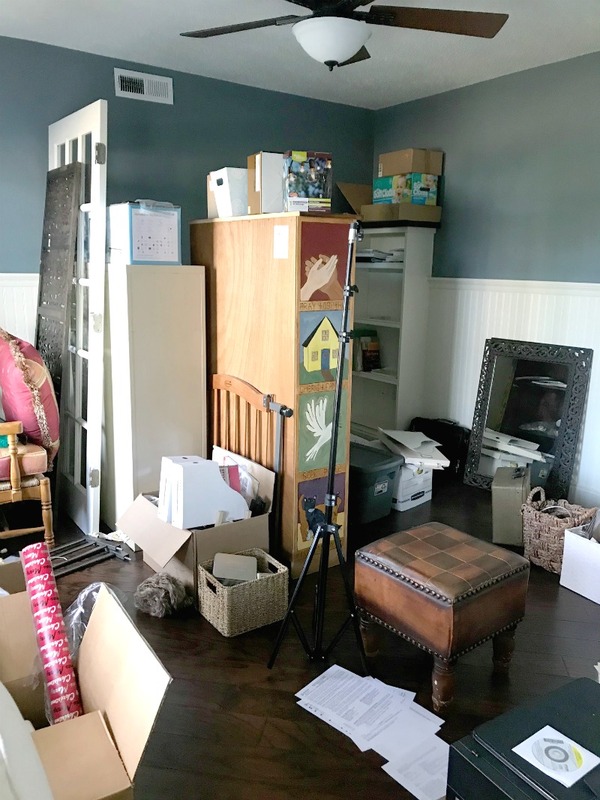 We not-so-affectionately referred to it as the junk room, and it became a horrible eyesore of items I should have just parted ways with during the move! Fast forward to this past summer when Armstrong Ceilings reached out to see if I would be interested in collaborating on a post showcasing how to cover popcorn ceilings. 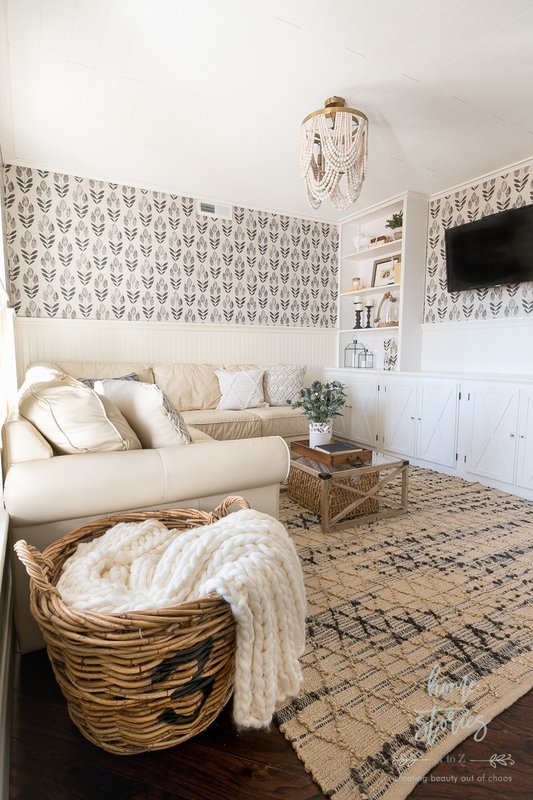 In September I installed WoodHaven Woven White Planks over our unsightly popcorn and the end result is simply gorgeous! The WoodHaven Woven Planks have a linen pattern that add a delicious layer of cozy texture to the room. 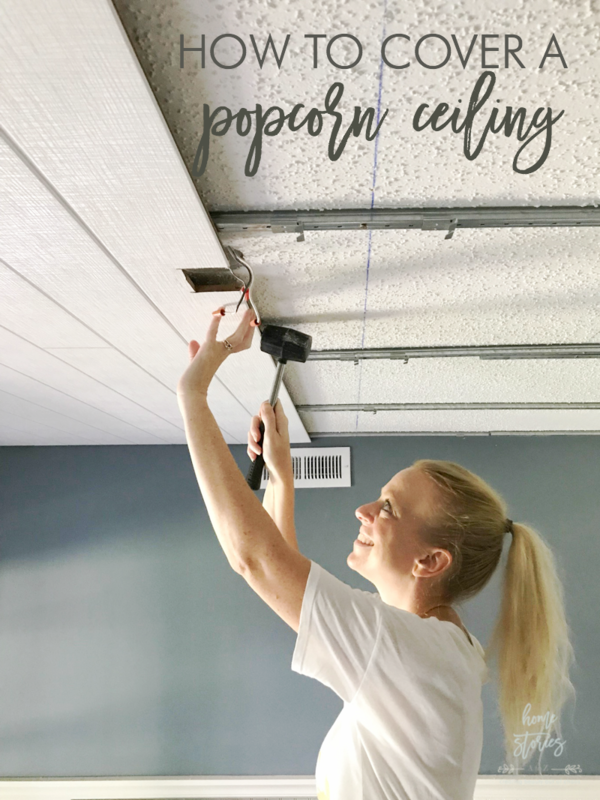 You can read the full tutorial post on How to Cover a Popcorn Ceiling Using Beautiful Armstrong WoodHaven Planks here. 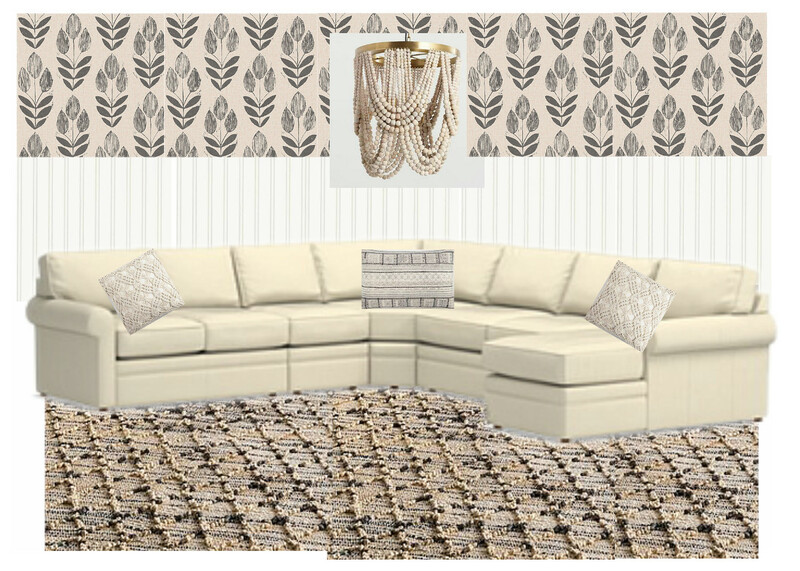 I also shared my design plan for the room in this post, but then life took over, a million little mishaps took place, and our media room sat unfinished for a ridiculously long time! Today I am proud to reveal the finished fruits of our do-it-yourself labor! 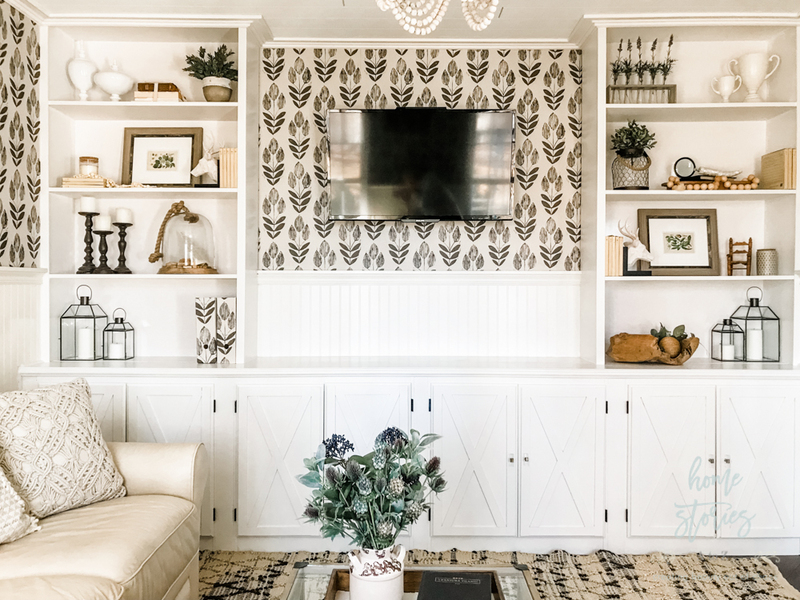 I promise to have a few tutorials for you soon on the room (including how we built the built-in bookshelves), but today I just want to share the pretty pics of the space and celebrate another room complete! I also promise to share a tutorial on how we hung the television on the wall. Of course we didn’t have studs or outlets where we needed them to be, so we had to get creative in order to center the television hardware and hide the cords! This room is very small, measuring just 12×12. 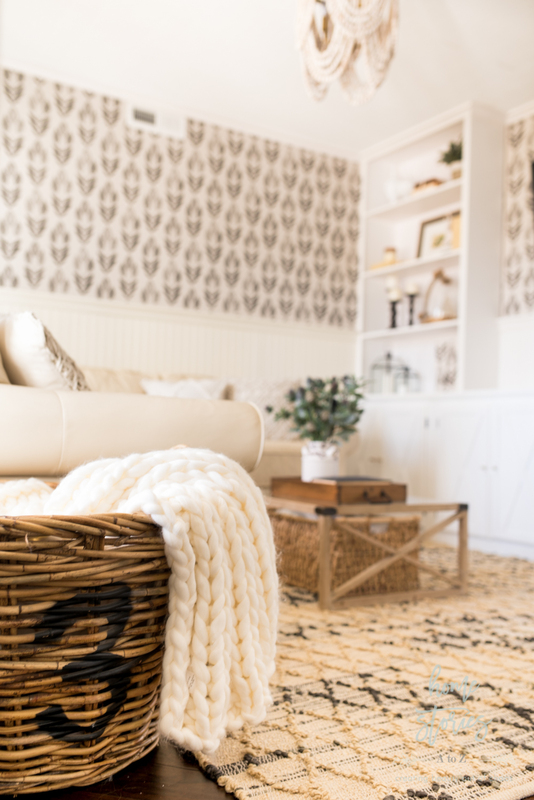 I added a lot of cozy neutral textures to make the space feel warm and inviting. It must have worked because I can’t keep the family or the animals out of this room now! 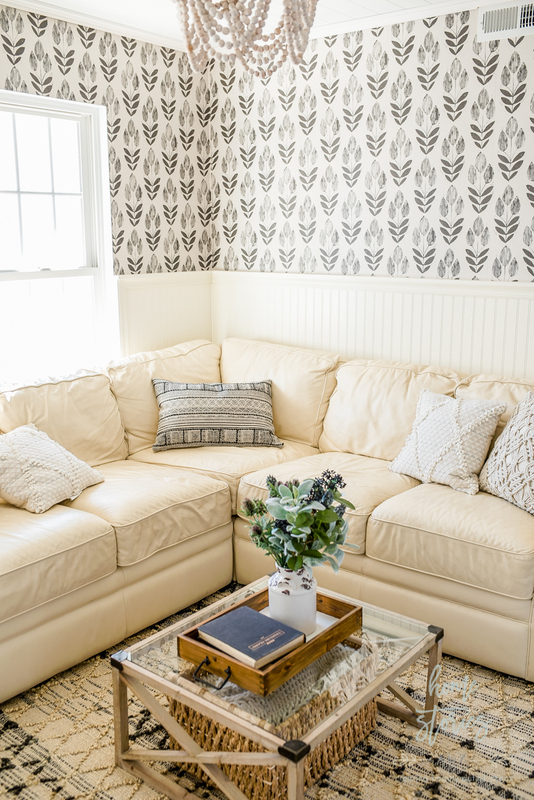 Everyone loves to hang out in here and snuggle on the sectional. Our leather sectional is from LaZBoy, and I received it years ago after participating in the La-Z-Boy Design Dash Challenge. It has held up so beautifully over the last six years! 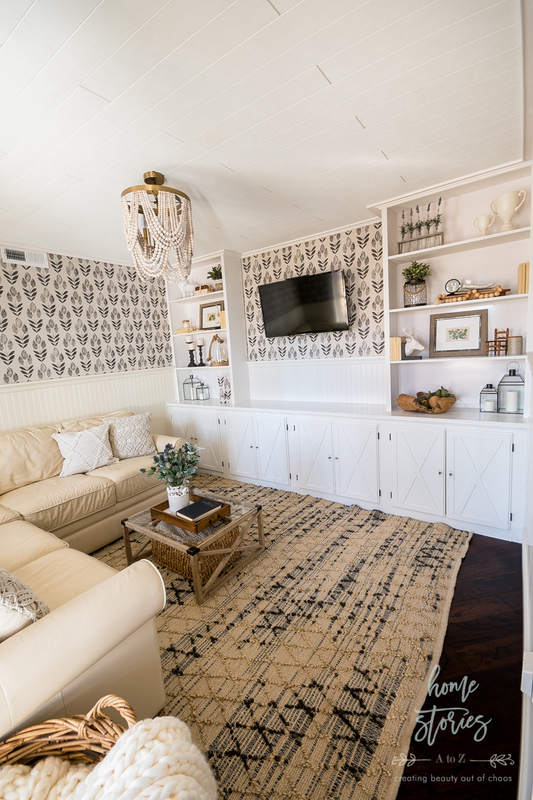 This home is much smaller on storage space than our previous home, so we are still learning how to make the most of every square inch! Our new built-in bookshelves are wonderful for hidden storage! They will also soon house a ton of books, but I wanted to style them sans books for this post. 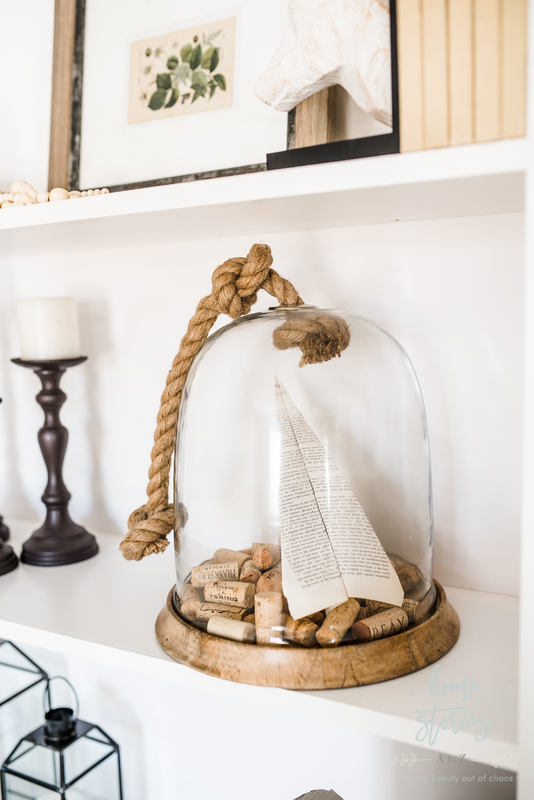 I have nothing against bookshelves filled with books but styling shelves is one of my favorite things to do! 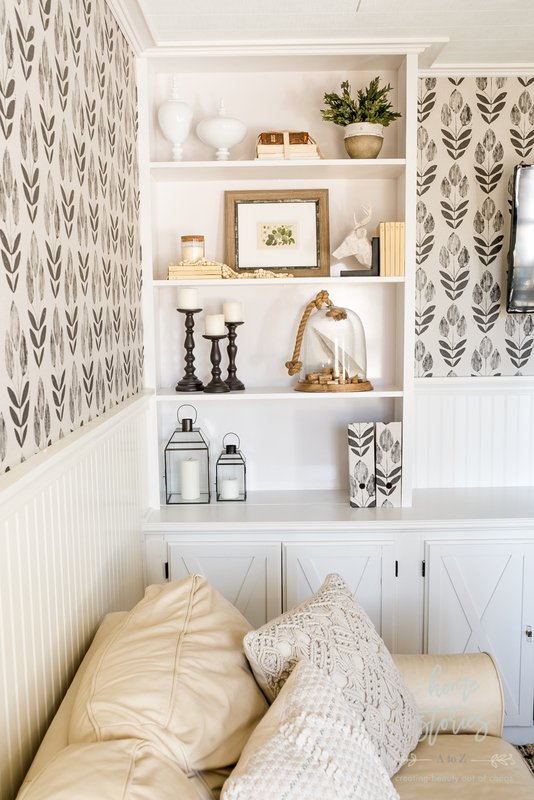 It was fun to play around with styling a bit before we have to buckle down and use the shelves for our book overflow! I didn’t have anything exciting to fill my cloche with so made a little bookpage paper airplane! The items that look like books on the shelves are actually old Kodak film reels of Matt and his brother when they were babies. ❤️ It’s always fun to display items which hold meaning to you! 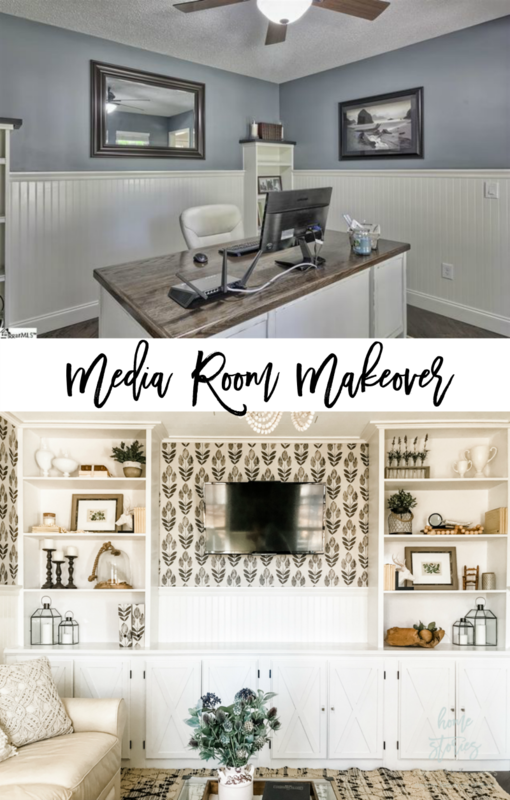 Thank you so much for stopping by to check out our media room makeover! 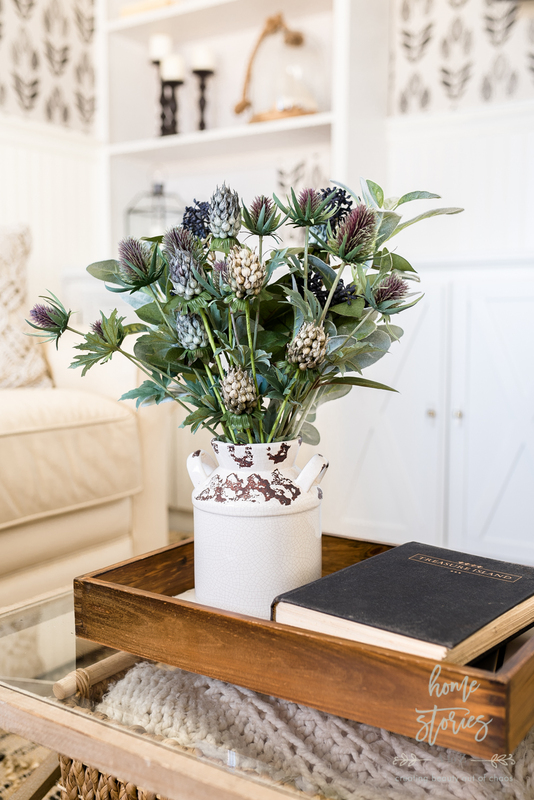 I hope it perhaps inspires you to tackle a neglected junk room in your own home this year! Click on the links below to be taken to the room sources that interest you.